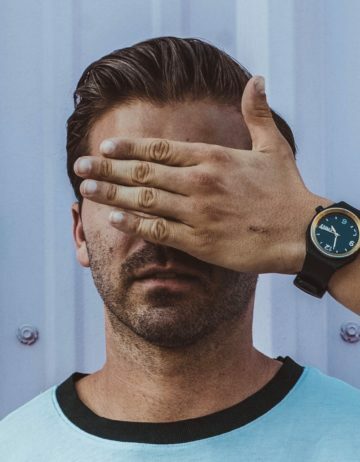 Yesterday, April 8, 2019, the Southern Alliance for Clean Energy (SACE) submitted highly critical comments to TVA proposing an overhaul and calling out lack of transparency and manipulation of data in the Draft 2019 Integrated Resource Plan (IRP) that TVA plans to finalize later this year. TVA’s 2019 IRP process has been remarkable for the level of opacity and the degree to which TVA manipulated data to reach their desired outcome: a continuation of the 20th century utility business model where utilities continue to ignore customer demands for distributed generation and energy efficiency and blindly plan to build new fossil and nuclear power plants galore. SACE has a long history of participating in utility integrated resource planning, both with TVA and utilities across the southeast. Integrated resource planning is the process utilities go through on a regular basis to evaluate future power needs and develop a plan to meet those needs. Historically this was a fairly simple process where utilities determined what year they would need to build their next large fossil or nuclear power plant. Thanks to changes in technologies and customer demands this planning process increasingly involves demand side measures like energy efficiency and distributed solar and a variety of medium and large scale renewable energy options. In past IRP processes TVA has worked with stakeholders and industry experts to who provided the company with current data on renewable and energy efficiency resources. 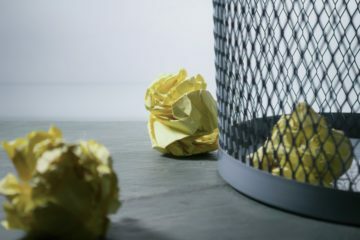 The Draft 2019 IRP, however, lacked meaningful details and data. Multiple stakeholders, including SACE, filed a request for additional documents and data under statutes in the National Environmental Policy Act (NEPA) and the Freedom of Information Act (FOIA). TVA delivered what can be charitably described as a partial disclosure with a little over 3 business days left in the comment period. The result falls far short of TVA’s stated mission to serve the public. Here’s an overview of our concerns. TVA failed to objectively evaluate resource options in its Draft 2019 IRP. SACE outlined the most egregious ways TVA steers the IRP model to choose its preferred resource mix in the comments we submitted to TVA on April 8. 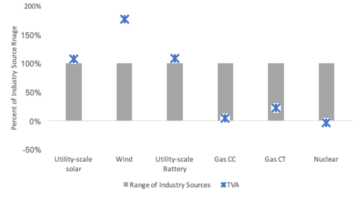 At a high level, TVA assumed unrealistically high costs for potential new wind, solar, and energy efficiency and unrealistically low costs for potential new gas and nuclear resources, as seen in the chart to the right. Notably, wind overnight costs were 177% of the highest industry estimate for a similar project. No wonder none of the proposed future plans include wind; TVA doomed it from the start! When these costs would not create the outcome they were looking for, they imposed arbitrary constraints on the model to limit solar and energy efficiency. TVA imposes arbitrary annual caps of 500 MW on utility-scale solar additions, which is a total limit of 8,000 MW because solar additions were only allowed in 16 years (2023-2038). In 22 of the 30 cases modeled by TVA these caps were hit in all 16 years, suggesting the model would select additional cost-effective solar if allowed. This cap on solar was not mentioned in the Draft IRP released for comment; it was only found out through inquiry by a member of TVA’s stakeholder working group and confirmed in the documents released at the last minute. It represents both a lack of transparency in the IRP process and poor modeling technique. In the Draft 2019 IRP TVA did not optimize for what is best for Tennessee Valley residents. TVA uses this IRP as a means to justify the decision to gut investments in energy efficiency in recent years. 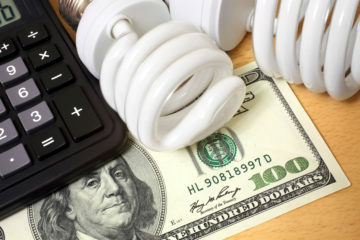 In the IRP TVA downplays the role of energy efficiency, particularly for residential customers, largely by claiming that natural adoption of energy efficiency eliminates the potential for TVA LPCs to capture additional cost-effective savings through utility efficiency programs. In other words, everything is already as efficient as can be… an obviously bogus assumption. TVA’s assertion that its energy efficiency potential is eroded by codes and standards does not stand up to scrutiny for three primary reasons. TVA made this assertion without examining empirical evidence for or against this claim. TVA’s assertion is easily countered by real world experiences of residential customers in the TVA service area who currently pay high energy bills. Despite facing the same dynamics, major utilities in the Southeast and beyond continue to reap substantial savings from utility efficiency programs. TVA capped energy efficiency at a level that is less than 3% of the estimated total economic energy efficiency available across all sectors through 2035 (TVA assumed 842 GWh, compared to 20,676 GWh derived from EPRI’s estimates over a similar timeframe). TVA’s nonsensical constraints on energy efficiency serve to manipulate the model and produce TVA’s apparently desired outcome: turning around and heading full steam back to the 20th century, even if TVA customers continue to struggle to pay high energy bills. Utility energy efficiency programs lower customer bills directly by reducing usage for participants (and usually up to 85% of customers participate over time), and indirectly by reducing the need for the utility to invest in generation, transmission, and distribution. TVA has already fallen behind other Southeast utilities in energy efficiency. If it adopts any of the proposed plans that gap will only widen further. IRP processes should be transparent and involve stakeholders throughout. A successful IRP minimizes total system costs without limiting customer choice and leads to the lowest possible customer bills, not a myopic focus on rates or a patronizing focus on spending choices by private customers. A successful IRP evaluates the entire life-cycle cost of all resources, both supply and demand and both existing and potential. A successful IRP should be overseen by an engaged oversight body. TVA states that its mission is “to improve the quality of life in the Valley through the integrated management of the region’s resources.” This IRP reflects a different mission – a mission to hold on to a 20th century business model without regard to the quality of life in the Valley, through centralized TVA management of the region’s electricity resources. As a result, TVA appears poised to further downsize its investment in helping customers manage their energy bills and burdens, slow-walk or halt renewable additions, and continue to invest in old, expensive, inflexible resources. We call on TVA to rebuild this IRP in a transparent and objective manner. If that request is not honored we call on the TVA Board of Directors to reject the IRP in its current form.